Imagine riding a horse down your own private stretch of tropical beach. The sight of exotic animals and the chorus of birdsong are your only distraction. The exclusive getaway of Cuixmala offers guests a unique experience in what was once a private reserve on Mexico’s West coast. This five-star resort sits in the midst of 25,000 acres of primeval jungle, matching its sublime service and attention to the smallest detail with immensely beautiful scenery and one-of-a-kind privacy. 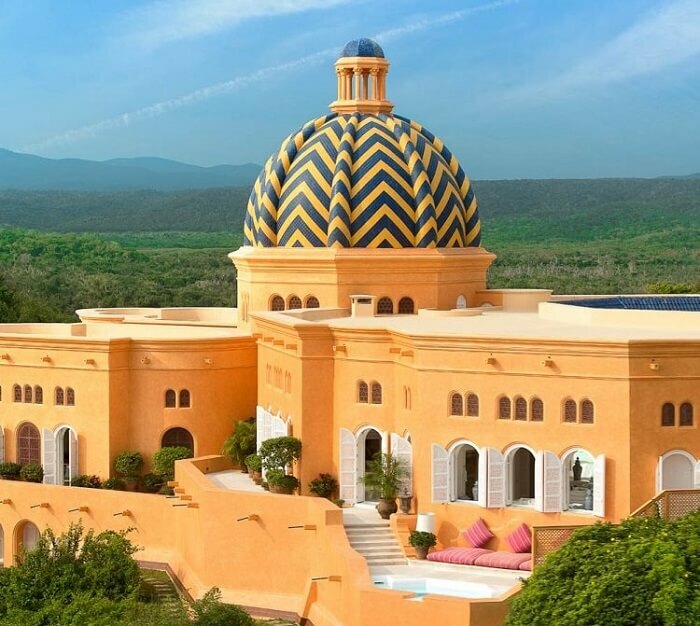 Moroccan-themed Cuixmala was originally built in 1989 as a private getaway for a British entrepreneur and politician, Sir James Michael Goldsmith. The resort is set on 25,000 private acres that function both as an exclusive retreat and as a nature reserve. Designed by French architect Robert Couturier, the property was originally a family home. It was converted into exclusive lodgings for guests as varied and famous as Robert Redford, George Lucas, Bill Gates, Mick Jagger, and Madonna. 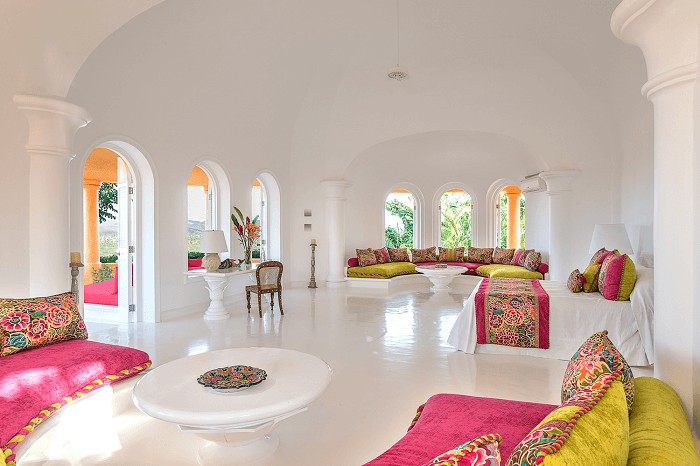 Guests can choose between rooms in the 60,000-square-foot main building, La Loma. There are villas that include several dedicated staff members, bungalows, and casitas. With a distinct Moorish theme throughout, the rooms are spacious and include views of the ocean and the jungle. Guests will marvel at the exotic zebra and eland strolling the grounds, as well as enjoying native species such as macaws, armadillos, and sea turtles. Casa Cuixmala Restaurant: dine under an expansive palapa roof with views of both the swimming pool and the Pacific Ocean. This restaurant sources all of its ingredients locally, from food grown on the estate to cheeses, yogurts, meats and other delicacies made in the surrounding area. Furthermore, menus focus on expertly prepared seafood, exotic fruits, and innovative interpretation of native cooking techniques. Casa Gomez Restaurant: The staff at this impressive restaurant cater to everything guests require. Moreover, by using organic, estate-grown produce supplemented with local specialties and fresh seafood, the traditional menu offers an authentic taste of the very best Mexican cuisine. Salt Water Swimming Pool: framed by an unforgettable staircase on one side and the blue Pacific on the other, this refreshing pool is accented by bright colors and provides a wonderful place to lounge, sip tropical drinks and enjoy views of the peaceful beach below. Fitness Facilities: guests can enjoy a game of tennis on the resort’s courts, take part in an outdoor yoga class or schedule a massage to ease away tired muscles. Resort staff can provide guests with binoculars and informative bird guides for identifying the many species found throughout the area. Moreover, a tour of the entire property by resort staff is also available to guests. Use of the bicycles located just outside guest residences is entirely complimentary. For those interested in visiting the swimming beach nearby, use of kayaks, stand-up paddleboards, lounge equipment, and snorkel gear is also complimentary. Guests can also assist in the resort’s sea turtle conservation efforts during hatching season. Nighttime releases of the baby turtles is a fun activity for all ages. 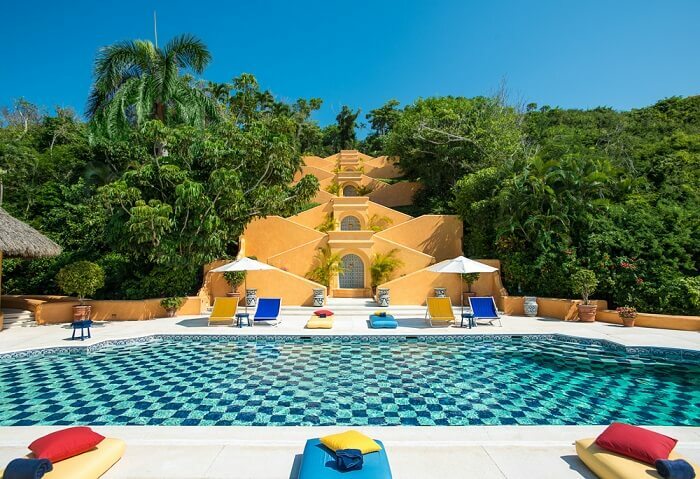 The resort is just an hour by car from the city of Manzanillo. Airport transfer from both Puerto Vallarta and Manzanillo can be arranged by the resort’s concierge. Guests can also charter a plane at either airport and land at the resort’s private landing strip. The concierge also has information regarding necessary arrangements. For those renting a car at Manzanillo’s airport, follow Carretera an Aeropuerto Manzanillo for 5 kilometers until reaching México 200 toward Puerto Vallarta. That will be a left-hand turn. Follow the México 200 for 69 kilometers. The road to the resort, Rancho Cuixmala, will be a left-hand turn. Drivers should then follow this private road until it dead-ends at the resort in approximately seven kilometers. Bordering Cuixmala, this protected jungle biome houses a fascinating array of wildlife, from shy peccaries to saltwater crocodiles to pumas, coyotes, and jaguars. An endless number of bird species make bird watching a rewarding pastime while on the reserve, and guides will be able to direct guests to the best locations for spotting various species. Explore nearby Chamala Bay in a double-masted sailing boat. Guests will be treated to a variety of drinks and snacks. Moreover, they can enjoy glimpses of dolphins, whales, sea turtles, and other aquatic species. There are small islands in the area, and guests can enjoy mooring just offshore and swimming or snorkeling in the clear water. Avid fans of the links can play 18 holes of imaginative layout right on the edge of the Pacific. The course creates an oval shape and offers amazing views in addition to the challenge presented by each hole. Guests can hike to the towering volcano (known locally as “El Viejo,” the Old Man) that is visible in its striking beauty from many parts of the property. Moreover, staff members will bring prepared snacks and lead a walk to the volcano’s treeline. However, beyond that, it is not safe to travel. Overall, from relaxing on pristine beaches to fishing, surfing and golfing, there’s a little bit of something for everyone. Have you ever visited Mexico’s Costalegre region to enjoy the exotic species and beautiful terrain? If you’ve stayed at Cuixmala, let us know all about your travels in the comments below. In addition, just to the north of Puerto Vallarta, another beautiful destination awaits you at Grand Velas Riviera Nayarit.